I’m excitedly working on getting prepared for a new MARKET created by the lovely duo and visionaries Deborah and Brittney of Vintage Society Co. 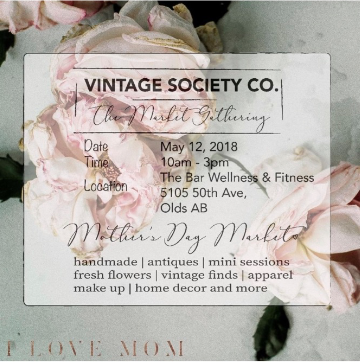 The Market Gathering is a Mother’s Day focused event bringing together a group of talented small business owners in the local Alberta area! Held at The Bar Wellness & Fitness in Olds, a unique and favourite local venue, we have a fabulous lineup of vendors including Vintage Society Co., Daizee’s Sweet Pickins, J.H.1895 Tribe, Meghan Unger Photography, Makeup by Ashleigh, Buttercream Clothing, Prairie Wood Design, Cedar and Sage Farm, Lofty Designs and Yours Truly! Promising to be a fabulous day offering home decorjewelleryhandmadevintagefresh flowershome goodsand much more! Also makeup application courtesy of Ashleigh and professional mom portraits by Meghan You’ll want to be a part of this fabulous event! Mark your calendar for May 12th 10am to 3pm at 5105 – 50 Ave Olds, Alta. There will be amazing prizes offered too! You can find info at any of the vendors instagram accounts or my events listing on Facebook as well.